Services include alternative healing techniques such as reiki, meditation and yoga, and integrated therapies, which are designed to treat the mind as well as the body in a noninvasive manner. In an oncology setting, these therapies help to alleviate treatment side effects, reduce anxiety and promote healing. The Cancer Institute is able to provide these support services to several hundred patients a year. All services and therapies offered are conducted by trained professionals whose goal is to provide comfort and support to the healing cancer patient. 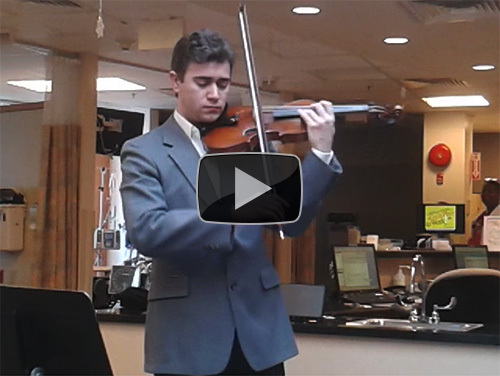 Peabody Conservatory graduate student Brandon Buckmaster performs for patients in the Cancer Institute's outpatient infusion center. Yolanda Marzouk, coordinator of Patient Support Services at the Cancer Institute, manages and coordinates these services and provides much-needed help to patients. She meets with new patients when they come in for their first therapy treatment, answers questions, assists with barriers such as transportation, and presents support group options. To learn more about Yolanda and the program you can read this blog post, or contact Yolanda at 410-601-0920. If you would like to support the continuation and expansion of Patient Support Services at the Alvin & Lois Lapidus Cancer Institute, please contact Development at 410-601-4438 or giving@lifebridgehealth.org.